URE2 is a broadband RMS voltmeter featuring extremely high accuracy and speed. A patented rectifier circuit allows measurement of signals with a crest factor of up to 7 and frequencies of up to 25 MHz. A patented rectifier circuit with microprocessor-controlled autocalibration makes for the outstanding measurement characteristics of URE2 In order to further enhance the accuracy, correction factors are determined for each instrument and measurement range and stored in a nonvolatile memory. 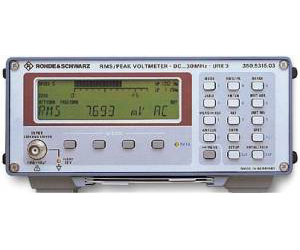 A zero function allows noise voltages and the inherent noise to be compensated for, the measurement accuracy being thus increased in particular at low levels.